A new exhibit titled “City of Champions: 2001, a San Jose Soccer Odyssey” opened in San Jose City Hall on Wednesday to honor the history of soccer in the Northern California city. San Jose is the only city in United States history in which a men’s and women’s professional soccer team won a championship in the same year. The city is making sure that everyone knows that, too. City Hall will commemorate that with an exhibit that will be on display from Wednesday through the end of February. Both MLS’ San Jose Earthquakes and WUSA’s Bay Area CyberRays won their respective championships in 2001, sending a traditionally quiet sports market into soccer bliss. Those two will be the primary focus of the exhibit, which will also include a look back at the NASL Earthquakes. The San Francisco Giants already honored the tenth anniversary of the CyberRays championship before their August 25 game, keeping the women’s soccer spirit alive in the Bay Area. FC Gold Pride won the 2010 WPS Championship before folding two months later. Below is a real-time recap of the 2001 WUSA Founder’s Cup, which the Bay Area won over the Atlanta Beat (wearing blue and purple not the updated WPS version of red and yellow). The match, played on August 25, 2001, at Foxboro Stadium, was broadcast in front of a national TV audience on TNT. Thanks to davebrett.com, we’ll be looking back at classic matches from the WUSA’s three year history. For thoughts from a journalist who covered the game, check out my chat with Dan Lauletta here. FOXBORO, Mass. (August 25, 2001) – What was supposed to be a defensive battle turned into a barnburner at Foxboro Stadium as the Bay Area CyberRays lifted the first-ever WUSA Founders Cup trophy in a 4-2 penalty kick win over the Atlanta Beat on Saturday. The teams played to a 3-3 draw after regulation and overtime before breaking the deadlock in penalty kicks. Julie Murray buried the game-winning penalty kick past Atlanta goalkeeper Briana Scurry to seal the victory. Murray also scored during regulation and was named the player of the game. Atlanta blew its chances from the spot when Bay Area goalkeeper LaKeysia Beene saved Sun Wen’s penalty to begin the shootout and Charmaine Hooper pushed Atlanta’s third penalty wide of the goal. The CyberRays converted all four kicks from the spot. 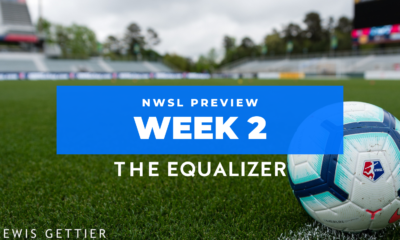 Penalty kicks were not a surprising outcome with the league’s top two teams squaring off, but how the teams got there was out of the ordinary. Scurry and Beene came into the championship match as the league’s top two goalkeepers, respectively. Scurry had a 0.82 goals against average while Beene had a 0.97 GAA. Goals were hard to come by against these two, but on this day, they came early and often. Kelly Lindsey opened the scoring for the Bay Area in the sixth minute on a volley from 6 yards out. Sissi delivered a free kick into the box from 35 yards out that fellow Brazilian Katia got on the end of and the ball popped out to Lindsey for the volley. Lindsey’s shot took a slight deflection off of CyberRays defender Brandi Chastain and the ball smacked off the inside of the post and into the net to give Bay Area the early lead. Five minutes later, Atlanta answered. Homare Sawa sent in a cross from the left flank that Nancy Augustyniak laid back to Kylie Bivens, who had plenty of time to bury the shot over Beene’s head from 12 yards out. Before the Bay Area could even recover, the Beat took the lead. Cindy Parlow flicked a Scurry punt into the path of Hooper and the Canadian international chest trapped the ball and chipped Beene with the outside of her left foot to make it 2-1. Atlanta continued to build momentum through Sawa on the left side of the field, but Bay Area mounted sustained pressure. Chaos broke out in front of goal in the 30th minute when Chastain found Murray on a long throw-in. Scurry blocked Murray’s initial attempt from 6 yards and quickly recovered to make a miraculous save on Katia’s follow-up attempt. Scurry pushed the ball off the crossbar while diving backward to preserve Atlanta’s lead. But just before halftime, the CyberRays equalized. Atlanta’s defense was pushed up high toward midfield and way out of position when Murray broke through and found herself in alone against Scurry. Murray calmly tapped the ball around Scurry and into the back of the net to tie the game at 2-2 heading into halftime. An out of position Dana Smith held Murray onside. Murray continued her hard work in front of net following halftime and came within inches of giving the Bay Area the lead in the 58th minute, but her shot went just wide. The back and forth action continued with Parlow putting her shot just over the bar a minute later for Atlanta. 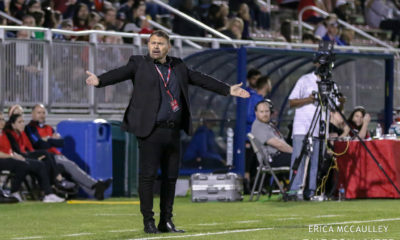 Atlanta head coach Tom Stone made a bold move in the 60th minute when he shifted his team into a more attacking formation. Stone temporarily pushed Bivens into a forward role before replacing her with Sun Wen three minutes later to complete the attacking shift. Parlow then dropped into more of an attacking midfield role and quickly combined with the 1999 Chinese World Cup star. Sun Wen sent in a cross to Parlow in the 77th minute and Parlow’s header went just wide of goal. The changes paid off in the 83rd minute when Atlanta took the lead from the same combination of players. Parlow flicked a long free kick into the path of Sun Wen at the back post and Sun Wen’s shot went through the legs of Oceguera and into the goal at the near post to give the Beat the late lead. Atlanta entered the game with a reputation of holding onto games late. The Beat did not allow a tie-breaking goal after the 80th minute in the 2001 season. But all conventional wisdom was irrelevant in this wild game. Sissi sent a long free kick into the box that found Katia’s head. The ball fell to Tisha Venturini, who out-muscled three Atlanta defenders and finished her shot from inside the six yard box to tie the game at 3-3. 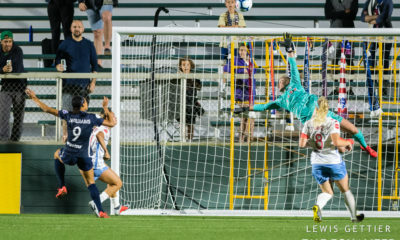 Overtime was the destined outcome for this historic first-ever professional women’s soccer championship, but not before Nikki Serlenga gave the CyberRays a scare, hitting a 28 yard free kick off the post deep into stoppage time. The first of two seven-and-a-half minute, golden goal overtimes began with Sissi leaving the game in tears. Ann Cook replaced the Brazilian, who had a groin injury. Tired legs had set in on this sunny August day in Massachusetts and overtime was less eventful than regulation, although it almost ended abruptly. Murray played a through ball to Katia, who was one-versus-one with Scurry, but Scurry made a point-blank save just seconds into overtime to ensure Atlanta at least made it to penalty kicks. From there, Bay Area shooters (Venturini, Carey Dorn, Katia and Murray) buried all four of their shots. 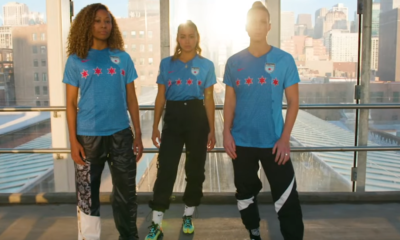 Chastain, slated to take the fifth kick if necessary, did not get a chance to replicate her 1999 World Cup heroics, but could be content knowing her team had just made history in front of 21,078 fans. Nancy Augustyniak had a spectacular game on the right side of defense. She was active both offensively and defensively. The CyberRays kept true to form. They were 6-0-0 in the regular season when Venturini registered a point. Parlow’s superior physical presence allowed her to dominate aerial play throughout the game. Curiously, the Bay Area’s Jacqui Little entered the game in the final minute of overtime for Megan Horvath, but Little did not take a penalty kick. Despite the 3-3 score after overtime, Scurry in particular made some incredible saves throughout the match to ensure that it even went to overtime and penalty kicks.